Unstuffed Cabbage Casserole doesn’t take even the half time of cabbage rolls but it is as scrumptious. Who bothers stuffing cabbage leaves when you can make equally delicious unstuffed cabbage rolls with the same ingredients in a much shorter time? Can you imagine that you will have the same taste as regular cabbage rolls by spending just half of the time? 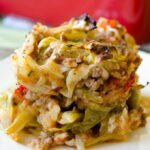 This cabbage casserole recipe is definitely for those who are looking for the easiest and quickest way of making delicate dishes. This is a lazy mom’s recipe, I know. But isn’t it great that it tastes pretty much like Stuffed Cabbage Rolls? Oh, yes they require a lot of effort and time and it is better when we find a shortcut. Hey, I have a shortcut for that laborious dish. Use the same ingredients but change the form! 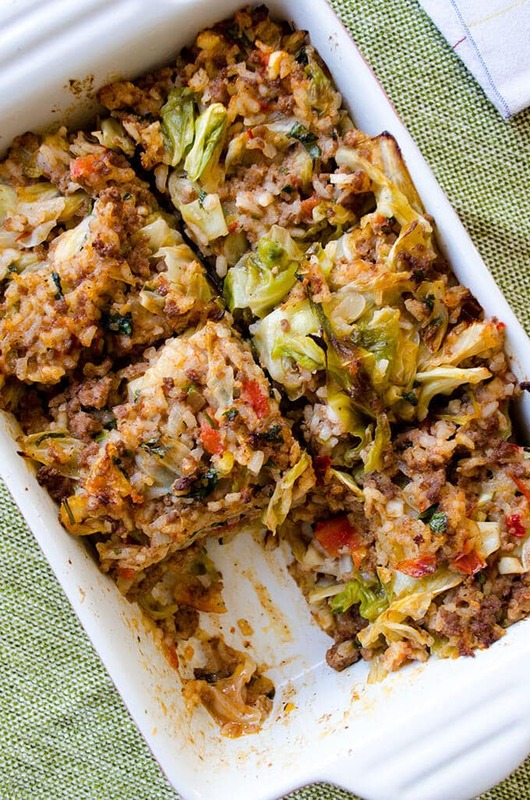 Deconstruct the rolls and serve in the form of unstuffed cabbage rolls. As a full-time teacher and part-time blogger, I don’t always have time or energy to stuff cabbage. Chopping everything and cooking them altogether is what I do mostly instead. The result is surprisingly amazing and tasty! Give the recipe a try and see it yourself! I’m not sure if you will ever bother making cabbage rolls again. Watch the video right above the recipe card below and see how easy it is! 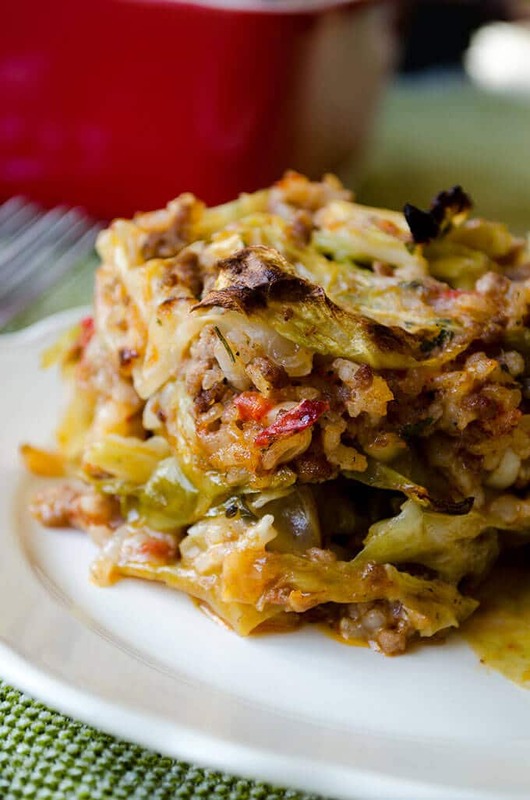 This cabbage roll casserole recipe is one of the best shortcuts in my culinary experience. It has three parts. First, blanch the cabbage leaves. Bring a deep pot full of water to boil and leave the roughly chopped cabbage leaves in it carefully. It takes about ten minutes for the chopped cabbage to soften. Transfer them in a bowl using a slotted spoon. Second, cook the ingredients in a pan starting with ground beef. Cook it with a little water. Water helps the ground beef to release juice, which makes it easier to get rid of any blocks. Stir and gently press over the ground beef until there aren’t any blocks left. Watch the video below to see how. Cook it covered over medium low heat for about 10 minutes. When there is little water left, add in olive oil, chopped onion and garlic. Give it a good stir. Then add in tomato paste, tomatoes, rice and the spices except cayenne pepper, stirring each time you add one. Add in the blanched cabbage, lemon juice, parsley and water. Cook covered over the lowest heat until water is absorbed and rice is tender. Third, bake it in a casserole pan. But before doing it, add some cayenne pepper and extra tomato paste to the pan, stir well and then transfer in a casserole pan. I don’t know why I didn’t use it in the video but it’s better to use a cast iron pan when cooking the ingredients. No need for a casserole pan then. Just bake it in the same pan. I love it when it’s possible reduce the number of dirty dishes! It is sliced perfectly when serving. Optionally, you can just skip the baking step if you don’t have enough time for it. Serve it after everything in the pan is cooked over the stove. As seen in the video below, I add extra tomato paste after everything in the pan is cooked, just before transferring it into the casserole pan. It bakes better when there is some wetness in the mixture as some of you suggested in the comments below. No need for any toppings on this cabbage casserole with ground beef and rice as I want exactly the same taste of my favorite cabbage rolls, but you can top your casserole with some cheese if you like. When updating the recipe, I made some changes with the help of your suggestions in the comments and emails. The former recipe before the update calls for cooked rice, which requires cooking rice in a separate pan before combining it with other ingredients. Some readers suggested cooking it in the same pan with other ingredients so that everything cooks together and it requires less effort. Such a wonderful and helpful suggestion! Thank YOU! That’s why, I cooked everything together in this updated version. There is one thing you need to be careful though: Add enough water to cook the rice. 3/4 cup water for 1 cup rice was enough for me. Other ingredients like tomatoes, lemon juice and cabbage helped it cook as well. On the other hand, you can definitely use instant rice to make this recipe even easier and quicker. You don’t need to worry about how much water you will need. Also, you can easily decide how much rice you’d like in your meal. Add some, give it a stir and add more if you think it’s not enough. Unlike uncooked rice, the amount of rice will not double as it’s pre-cooked. Can I Make Unstuffed Cabbage Recipe Without Rice? It is possible to make this recipe either with or without rice. If you are on a diet or want to reduce the carb in your meal, make it without rice. I’ve tried it and it’s as tasty and filling as Beef Cabbage Stew, so I’m sure you will be satisfied with it as well. Make sure there is no need to add water in the pan if you decide to leave the rice out. 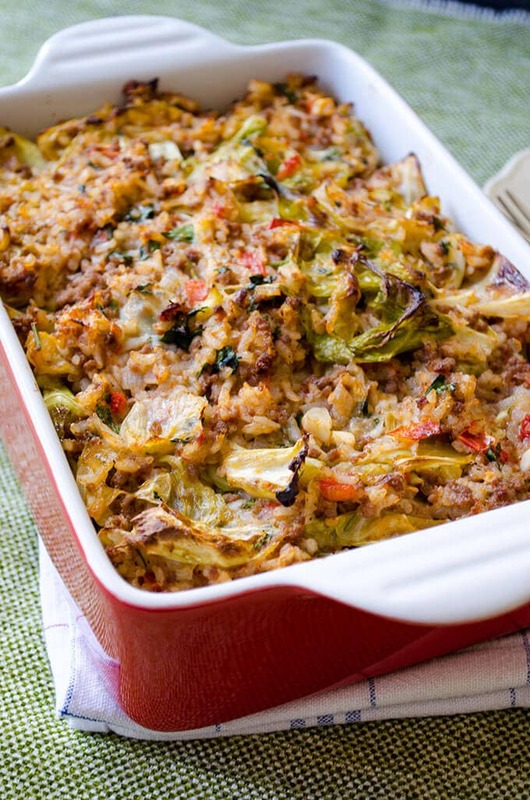 Can I Make This Cabbage Casserole with Quinoa? If you are a fan of quinoa, feel free to substitute quinoa for rice. Make sure you add enough water when cooking it though. 3/4 cup water for 1/2 cup quinoa should be fine. Also, simmer it over the lowest heat to give it enough time to cook. 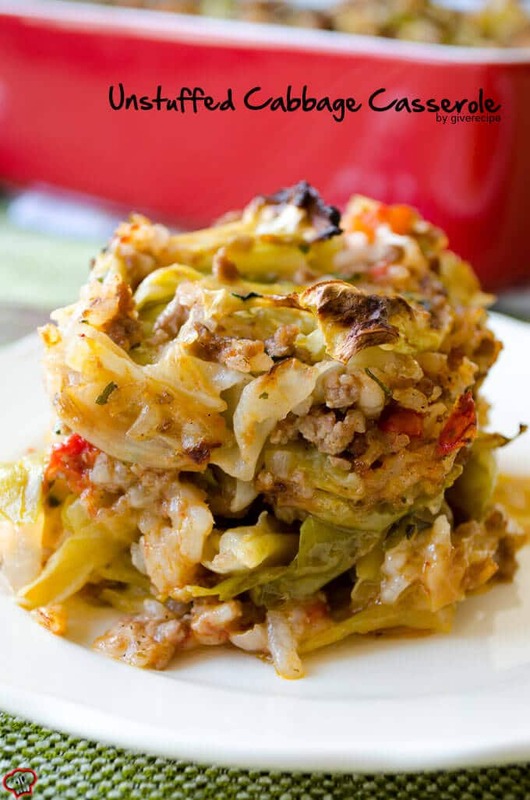 Want Vegetarian Unstuffed Cabbage Rolls? If you want a lighter version, leave the ground beef out and make it vegetarian. I love both versions. Making it meatless is better when serving it as a side dish. To make it even tastier, drizzle extra olive oil and lemon juice on it when serving. One of our readers suggested some cheese topping when baking, so I think it’s a great idea when you turn it into a vegetarian dinner. The best thing to serve with this Unstuffed Cabbage Casserole is a bowl of plain yogurt or a fresh and crisp salad. I love it really tangy, so I squeeze extra lemon on my part when eating as you can see in the video. Can I Freeze Unstuffed Cabbage Rolls? This is a freezer-friendly recipe. You can freeze it either after it is cooked over the stove or after it is baked. Just make sure it cools completely before freezing. Defrost overnight in the refrigerator and reheat in the oven when you need a quick meal. THANK YOU all for helping me develop the recipes on the blog. This is what I love most about blogging! I’m still open to new ideas on this recipe. Please share them in the comments section if you have any! The shortcut recipe for stuffed cabbage rolls. Baking time is 40 minutes but you need to cook it for about 30 minutes in a pan over stove beforehand. Hello from North Greece! Indeed our cuisine is so similar to yours I’m astonished with all your wonderful recipes and the presentation as well. Now I make this dish in winter mostly but I also add leeks, carrots and celery root…..you should give it a try. Keep creating…. Hi Sophie, you’re so kind! I love how similar our cuisines are. Heard a lot about awesome dishes, especially mezzes in your country. Hope to try them in their original place one day. Awww you’re so kind Sophie! Wish you a wonderful weekend! This was extremely frustrating. First, it takes well over 10 min to prep. Next, I would advise against uncooked rice. At this moment, I am still waiting for the rice to cook and in the meanwhile the food is burning at the bottom of the pan. It’s after 8pm (started at 6:30) and I am starving. Once this damn rice is finished, I have to then put it in the oven another 40 min. Great recipe! I was Google-ing cabbage recipes and found yours. The only part that took a lot longer than expected was the rice cooking. I used brown rice and it took about 40 minutes to cook and I had to turn the heat up to medium to get it moving. My 10-month old loved it, even with the cayenne pepper, ha. Great flavors. I will definitely try more of your stuff. Glad I found your blog! Hi Katie, glad to hear that you and your 10-month old loved the recipe. Maybe it is because we’re using different types of rice. I guess I need to edit the recipe and the post as several people have a similar problem. Hi Jill, I’m sorry the recipe didn’t work for you. Different types of rice might cause this. Mine cooks fine. I’ll edit the post soon accordingly. My husband and I really enjoyed this. Like others, I added extra diced (canned) tomatoes because I thought it needed more liquid. I also added kielbasa, which added some extra spice. Delicious!! Hi Susan! I’m so happy to hear that you both loved it! Adding extra tomatoes might be a good idea if you feel that it needs more liquid. I’m sure yours become even tastier. Thanks for sharing your thoughts with us here. Best! Thanks for the recipe! I’m baking it now! Should I cover the casserole dish in the oven? Or should it be uncovered? Thanks! Hi Sarah, you don’t need to cover it. I don’t understand how this dish has so many rave reviews. I followed the recipe exactly as written. First, the rice did not cook all the way through. I was expecting the mint, cayenne and lemon juice to really add a robust flavor. Instead it was just off. Overly spicy but not enough salt so a bland dish that’s too spicy for the average pallet. (Unless cayenne is a regular occurrence with your meals, one Teaspoon is way way too much. You’ll be drinking a quart of milk with every bite. My husband and children agree wholeheartedly. We will not be making this again. Sorry. Hi Donna! Thank you for sharing your additions with us. I love to make changes in my regular recipes when a reader suggests. I haven’t eaten it yet . I’m currently waiting by the stove for my brown rice to cook through . It’s been well over 30 minutes and after adding more water to get the rice softer it still isn’t cooking correctly . I definitely think you should cook the rice before hand and save yourself the trouble of doing it with everything else . I encountered the same thing, trying to get my rice done all the way through. It seems like everything has kind of turned to mush cooking it all beforehand like this. I have it all prepared and ready to go in the oven in a bit. I’m hoping the baking process will somehow firm things up a bit? I’m skeptical, but hope to be pleasantly surprised. I’ve made a few skillet UN cabbage roll dishes, with basically the same ingredients, that you can just toss everything in all at once, including uncooked rice, and it cooks up nicely on the stove. Thanks so much for sharing! I was afraid to use the amounts of mint & cayenne suggested so I scaled those way back – just out of personal preference. Maybe next time I make it though, I will give it a try without changing anything. We did really enjoy it! Even my husband who initially turned his nose up at the idea! Thanks! I’m so happy to hear that you loved it! You should say cooked rice in the ingredients. I didn’t use cooked rice in this recipe. It cooks with all the other ingredients. Nothing new here. My family has been doing this for at least 70 years.